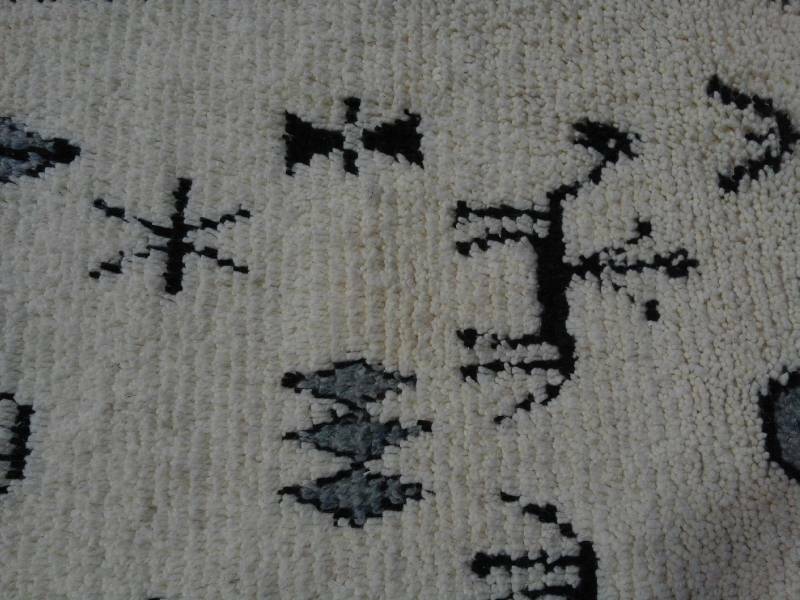 The traditional rug of Ait Bouli is a pile knot rug, which can be found in every home in the area. 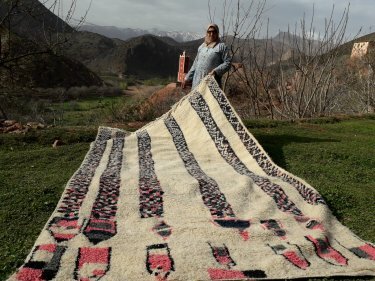 Touda is committed to maintaining this tradition and exclusively weaves pile knot rugs using designs inspired by the environment of Ait Bouli and its unique culture. 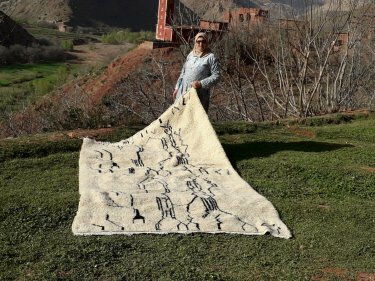 The colors in her rugs reflects her desire to preserve her culture as she only uses colors that can be derived from local plants. 2919Dh: This price includes shipping within Morocco. To order, e-mail us at hello@theanou.com and we will help you with payment options. 2919Dh: Le prix inclut la livraison au Maroc. Pour passer commande envoyez nous un message à l'adresse hello@theanou.com et nous vous présenterons les différentes options de paiement. Want to visit Touda Bous-Enna in person? The cost is $10 USD per person, all of which is donated to the cooperative. Visits include tea, snacks and work demonstrations! Fill out the form below and we'll send you additional details and payment options when artisans confirm your time. Touda is married with two children. She primarily manages her home and tends to live stock and a small garden ... show more Touda is married with two children. She primarily manages her home and tends to live stock and a small garden in the front of her home. 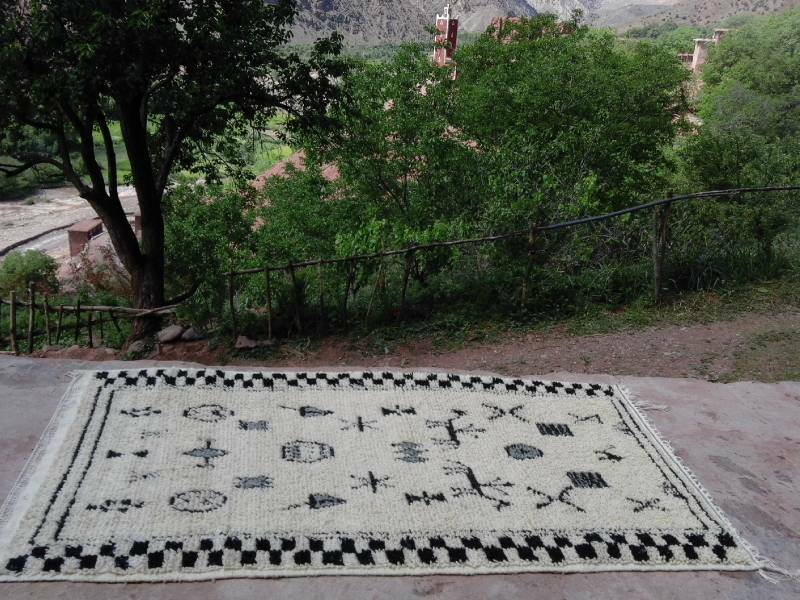 She is passionate about weaving and cultural preservation -- two passions that are blended together with every rug she posts on her online store. 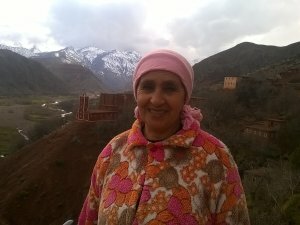 Ait Bouli is located deep in the High Atlas Mountains of Morocco. Tucked amongst mountains, ... show more Ait Bouli is located deep in the High Atlas Mountains of Morocco. Tucked amongst mountains, vast plains and fields filled with hundreds of grazing sheep are a common site. It is fitting then that in the local dialect of Berber, Ait Bouli means "The people who own the sheep". 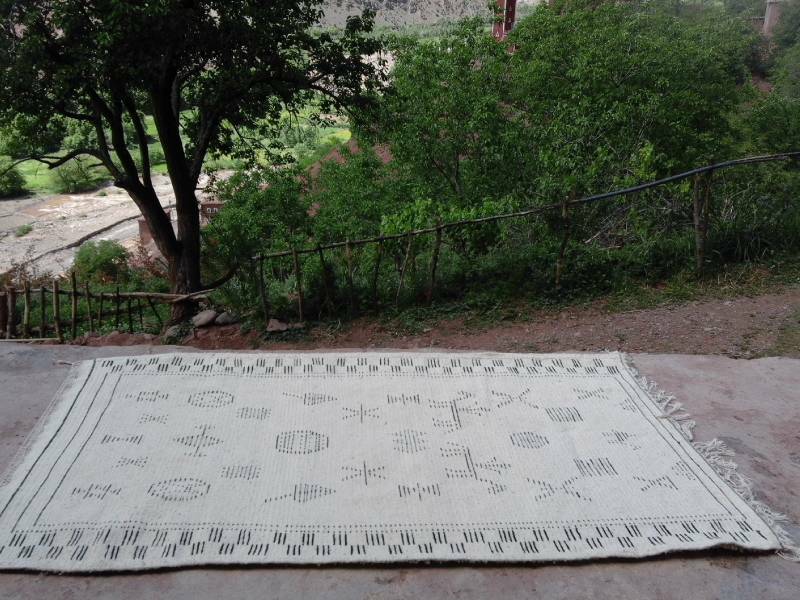 All wool that Touda makes is bought directly from the shepards who roam the mountains of Ait Bouli. Every family in Ait Bouli owns their own loom. Touda is no exception to this. ... show more Every family in Ait Bouli owns their own loom. Touda is no exception to this. 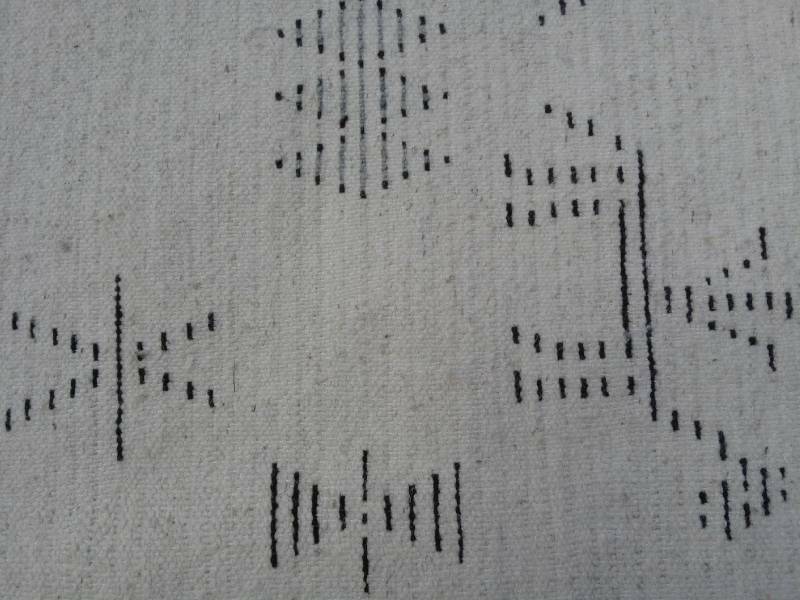 Touda's loom though carries a special story. When she learned how to weave in Marrakech, she had the loom made by local woodworkers over 30 years ago (as of 2015). She has kept the same loom and brought it back to Ait Bouli. The loom has become a fixture in her life representing a life's worth of creative work. 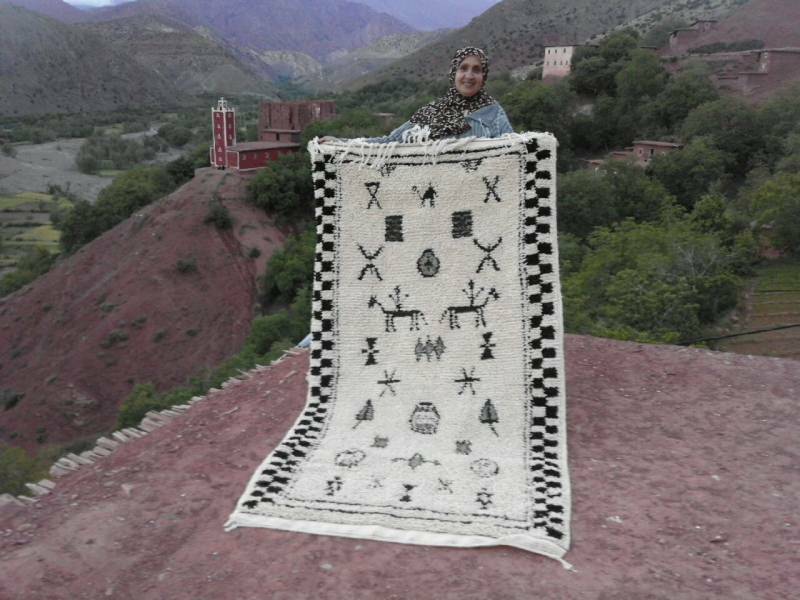 In time, she hopes that with add another loom that can create larger rugs A local woodworker made the loom several years ago and it has become a fixture in kitchen of Touda. 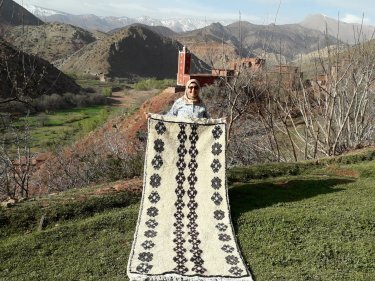 Her loom is small and she hopes that with time, she can one day ask the local woodworker to make a bigger loom so she can weave large rugs.